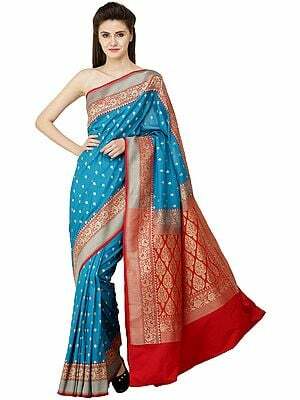 The etymology of the word sari or saree is from the Sanskrit word 'sati', which means strip of cloth. This evolved into the Prakrit 'sadi' and was later anglicised into sari (often spelled as saree). 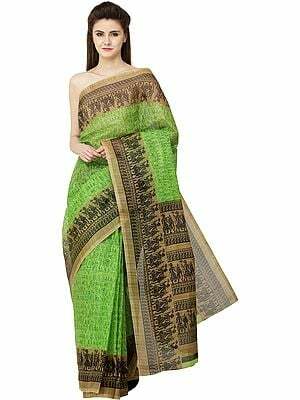 Indian civilization has always placed a tremendous importance on unstitched fabrics like the sari and dhoti, which are given sacred overtones. The belief was that such a fabric was pure; perhaps because in the distant past needles of bone were used for stitching. 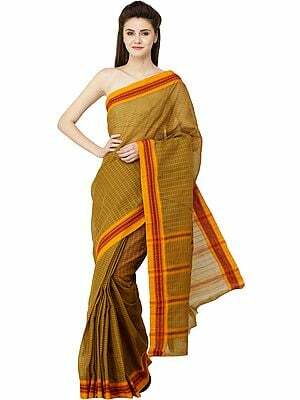 Hence even to the present day, while attending pujas or other sacred ceremonies, the men dress up in dhotis while women wear the sari. The Indian Sari, like so many other textiles, gives the lie to the hierarchical distinction made between fine arts and crafts. 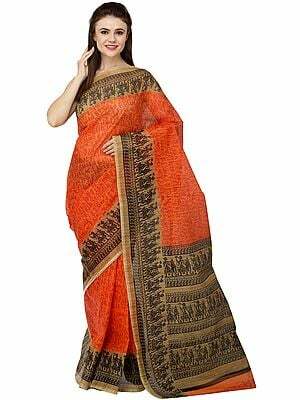 The approximate size of a sari is 47 by 216 inches. Although it is an untailored length of cloth, the fabric is highly structured and its design vocabulary very sophisticated. The main field of the sari is framed on three sides by a decorative frieze of flowering plants, figurative images, paisleys, or abstract symbols. Two of the borders define the edges of the length of the sari and the third comprises the end piece, which is a more complex version of the other two borders. 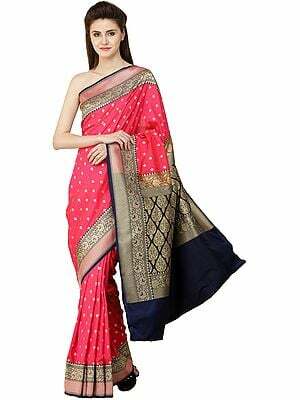 This end piece is the part of the sari that is draped over the shoulder and left to hang over the back or front, known popularly as the Pallu or Anchal. The pallu usually elaborates the theme found in the two borders and the actual field of the sari, a sort of repetition and amplification in the manner of the Indian musical mode, the raga. This beautiful metaphor thus compares the two narrow borders to the introductory recital of the pure notes and the pallu to the song. 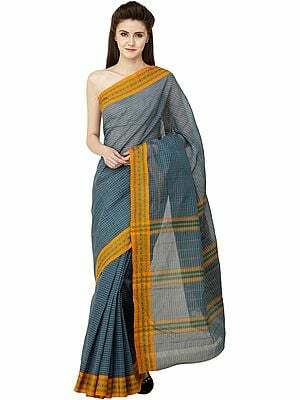 The design of the Indian Saree, whether woven, embroidered, painted or block-printed, needs to maintain the proportion and balance between the actual field of the sari, the borders and the pallu. The pattern creates its own rhythm. Each sari in the modern era requires a matching set of blouse and underskirt for draping it. 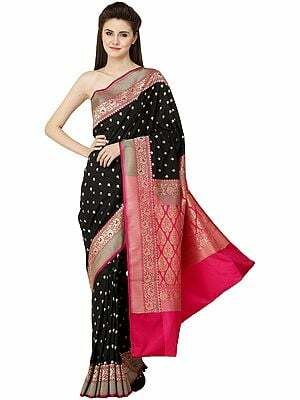 All saris in our collection come along with a matching blouse piece. You can also have the blouse and petticoat tailored to your custom measurements, at a nominal extra cost. 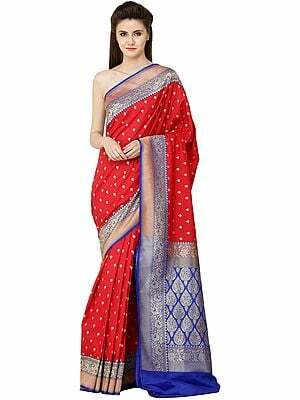 To provide your measurements, click on the Buy Now icon of the sari of your choice. Buy designer Indian Salwar Kameez online at ExoticIndia. Select from a wide range of exquisite Salwar Kameez Suits like Cotton, Silk, Hand Embroidered & more! Shop for a wide range of Indian Skirts like Wrap Around, Printed, Sari Skirts & more at ExoticIndiaArt – the online Indian Textiles & Apparel Store.